Abstract. Estimated external radiative forcings, model results, and proxy-based climate reconstructions have been used over the past several decades to improve our understanding of the mechanisms underlying observed climate variability and change over the past millennium. Here, the recent set of temperature reconstructions at the continental-scale generated by the PAGES 2k project and a collection of state-of-the-art model simulations driven by realistic external forcings are jointly analysed. The first aim is to estimate the consistency between model results and reconstructions for each continental-scale region over the time and frequency domains. Secondly, the links between regions are investigated to determine whether reconstructed global-scale covariability patterns are similar to those identified in model simulations. The third aim is to assess the role of external forcings in the observed temperature variations. From a large set of analyses, we conclude that models are in relatively good agreement with temperature reconstructions for Northern Hemisphere regions, particularly in the Arctic. This is likely due to the relatively large amplitude of the externally forced response across northern and high-latitude regions, which results in a clearly detectable signature in both reconstructions and simulations. Conversely, models disagree strongly with the reconstructions in the Southern Hemisphere. Furthermore, the simulations are more regionally coherent than the reconstructions, perhaps due to an underestimation of the magnitude of internal variability in models or to an overestimation of the response to the external forcing in the Southern Hemisphere. 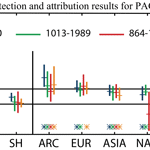 Part of the disagreement might also reflect large uncertainties in the reconstructions, specifically in some Southern Hemisphere regions, which are based on fewer palaeoclimate records than in the Northern Hemisphere. How to cite: PAGES 2k-PMIP3 group: Continental-scale temperature variability in PMIP3 simulations and PAGES 2k regional temperature reconstructions over the past millennium, Clim. Past, 11, 1673-1699, https://doi.org/10.5194/cp-11-1673-2015, 2015. A comparison of model simulations and reconstructions at the continental scale over the past millennium indicates that models are in relatively good agreement with temperature reconstructions for Northern Hemisphere regions, particularly in the Arctic. This is likely due to the relatively large amplitude of the externally forced response across northern and high-latitudes regions. Conversely, models disagree strongly with the reconstructions in the Southern Hemisphere.